If you’re still stuck with the hassle of a manual thermostat, consider upgrading to a programmable thermostat. With a manual thermostat, you have to change the temperature of your home, but programmable thermostats are “smart thermostats” that operate according to pre-programmed settings to automatically adjust to the perfect temperature for you. Programmable thermostats make it easy to schedule your desired temperature in advance, and you can set it based on the time of day, day of the week, or season. Some programmable thermostats also have the ability to adjust the temperature in different zones of your house. So if you spend more time downstairs, you can make sure it’s always set to the perfect temperature. You can have a more comfortable home today—just call Ernst Heating & Cooling to schedule an appointment! Convenient: The best part about a programmable thermostat is that you can set it and forget about it. The thermostat can lower the temperature during the day when you’re at work or running errands and have your house warmed back up just in time for you to get home. Once you program it to your specific routine, the system will do the rest. Efficient: Programmable thermostats are much more efficient because they aren’t wasting energy heating or cooling your home when you’re not there. They only work as hard as they need to, which means they also conserve energy. Economical: According to the Department of Energy, turning your thermostat back 7 to 10 degrees for an 8-hour period each day can help you save up to 10% on your heating and cooling bill annually. A programmable thermostat can help start saving you money. Which Programmable Thermostat Model Is Right for You? Now that you’re ready to take advantage of the benefits of a programmable thermostat, how do you know which model is right for you and your home? Here are a few types of programmable thermostats and the models we recommend. 7 day models: Program different settings for each day of the week. A 7-day model offers the most flexibility, which is great for busy schedules. 5+2 day models: Set the same schedule for the five days during the week when you may be out of your house more, and set another one for the weekends. 5-1-1 models: These models are similar to the 5+2 day models in that they allow you to set the same heating and cooling schedule for the weekdays. But you also have to opportunity to program different settings for Saturdays and Sundays. 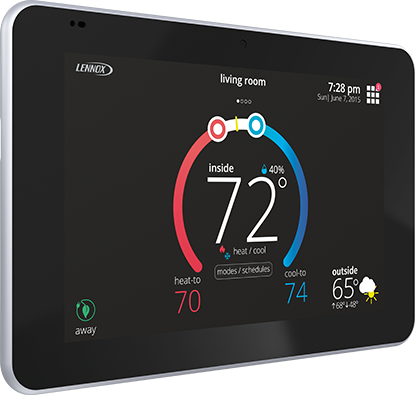 Ernst Heating & Cooling offers reliable Lennox programmable thermostats in East Metro Illinois. Choose from ComfortSense thermostats, which come with touchscreens and offer month energy monitoring reports, or the newest model, iComfort® S30. Whether you know which programmable thermostat model you want or you need assistance looking into your options, Ernst Heating & Cooling is here to help. From start to finish, we pride ourselves on quality work and superior customer service. We’ll set you up in no time so you can start enjoying the convenience of your new programmable thermostat.